© 2005, 2002, 1987 Margaret L. Benner All rights reserved. COMMA RULE #1 – THE COMMA IN A SERIES: Use commas to separate items in a series. Any of these can be put into sentence form. COMMA RULE #2 – THE COMMA WITH COORDINATE ADJECTIVES: Use commas between coordinate adjectives. “Coordinate adjectives” are adjectives placed next to each other that are equal in importance. 1. See whether “and” can be smoothly placed between them. 2. See whether the adjectives’ order can be reversed. In this example, a comma belongs between happy and lively because they are coordinate adjectives. First, try the “and” test. And placed between the 2 adjectives sounds smooth. Second, try reversing the adjectives. When the adjectives are reversed, the sentence still makes sense. Thus, happy and lively are coordinate adjectives in the example and should be separated by a comma. CAUTION: Not all adjective pairs are coordinate adjectives. Thus, not all adjectives should be separated from one another by a comma. In this example, no comma belongs between the two adjectives young and golden because they are not coordinate adjectives. And placed between the two adjectives does not fit smoothly. When the two adjectives are reversed, they do not make sense. Thus, young and golden are not coordinate adjectives and should not be separated by a comma. COMMA RULE #3 – THE COMMA IN A COMPOUND SENTENCE: Use a comma before and, but, or, nor, for, so, or yet to join two independent clauses that form a compound sentence. 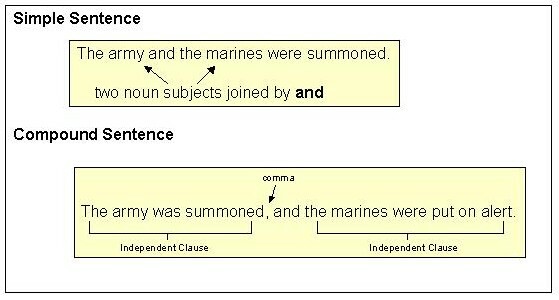 A compound sentence is a sentence that has 2 independent clauses. An independent clause is a group of words with a subject and verb that expresses a complete thought. It is also known as a simple sentence. An independent clause can stand alone as a sentence. This last type of compound sentence is the one we will concentrate on for comma use. 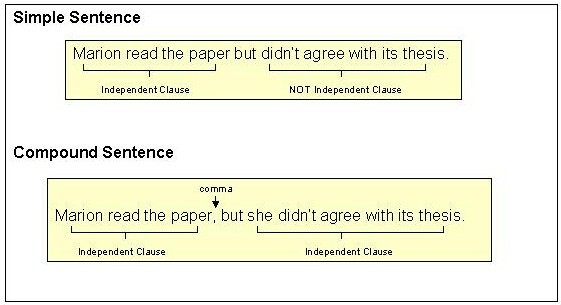 A compound sentence must have two independent clauses – not just two verbs, two nouns, or two groups of words that are not independent clauses. In the above example, two verb groups are being joined by and. The second verb group does NOT have a subject; thus, it is NOT an independent clause. Therefore, NO comma belongs before and. This example is a simple sentence with a compound verb, not a compound sentence. However, we can make this sentence into a compound sentence by simply making the last verb part into an independent clause. Now we have a “bona fide” compound sentence. 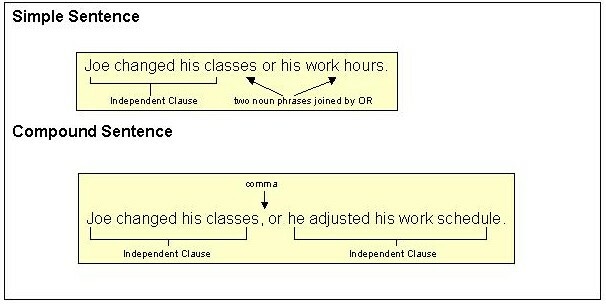 The two independent clauses are separated by a comma and the word and. Here are some other examples which illustrate the difference between compound elements in simple sentences (no comma) and true compound sentences (comma). Now you are ready to try an exercise. 1. Know the seven joining words (for, and, nor, but, or, yet, so). 2. Can distinguish between simple sentences with compound elements (no comma) and compound sentences (comma). COMMA RULE #4 – THE COMMA WITH INTRODUCTORY WORDS: Place a comma after introductory phrases that tell where, when, why, or how. 1. After a long introductory phrase. Usually, it is NOT necessary to use a comma after short introductory prepositional phrases. 2. After an introductory phrase made up of “to” plus a verb and any modifiers (“infinitive”) that tells why. Use a comma even after a short “to” + verb phrase that answers why. You can tell you have this kind of introductory “to” + verb phrase when you can put the words “in order” in front of the phrase. Be careful! Not all introductory “to” phrases tell why. when? where? why? how? to what degree? NOTE: When such a clause comes at the end of a sentence, do NOT use a comma. COMMA RULE #5 – THE COMMA WITH NONESSENTIAL WORDS, PHRASES, AND CLAUSES: Separate with a comma any nonessential words or groups of words from the rest of the sentence. 1. Separate “interrupter” words like however, nevertheless, yes, no, of course, from the rest of the sentence. 2. Separate a “renamer” (an appositive) from the rest of the sentence with a comma. 3. 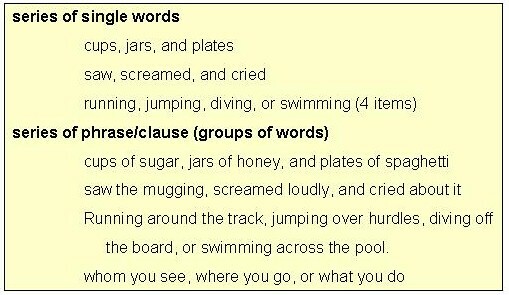 Separate adjective phrases from the essential parts of the sentence. In each instance above, “Mary Roberts ran down the street” comprises the essential part of the sentence. The adjective phrases are nonessential and should be separated from the rest of the sentence with commas. 4. Separate nonessential adjective clauses from the rest of the sentence. The essential adjective clause should NOT be separated from the sentence with commas. The nonessential adjective clause (like other nonessential elements) SHOULD be separated with commas. Look at example A. If we remove the adjective clause “who robbed the bank,” the sentence reads, “The man was caught today.” Without the adjective clause (“who robbed the bank”), we do not know which man was caught. Thus, the adjective clause is needed to complete the sentence’s meaning. In other words, this adjective clause is essential. As the rule notes, do not use commas around essential adjective clauses. Now look at example B. If we remove the adjective clause “who robbed the bank,” the sentence reads, “Sam Spider was caught today.” Without the adjective clause (“who robbed a bank”), we do know which man was caught (Sam Spider). Thus, the adjective clause is NOT needed to complete the sentence’s meaning. In other words, this clause is nonessential. Following the rule, you should separate this adjective clause from the rest of the sentence. Now click on the link below to do the post test.